I have been a visual astronomer all my life, but I only recently began imaging, finally caving-in to the promise of digital convenience. I have been using the Tele Vue-NP101is since 2016 and have been very pleased with all aspects of the instrument, but it’s the optics that really impress. Along with the large field corrector, this rugged refractor gives me geometrically perfect stars well outside the center of my images. The tube’s wide open focuser gets plenty of light onto my full frame Canon 6D sensor, illuminating right to the edge of the field. If I take good flat frames for my imaging session, I often will not even need to crop, except to eliminate stacking artifacts. Combined with the instrument’s 540-mm focal length, I find I have a nice balance between a generous wide field and fine details in my final images. 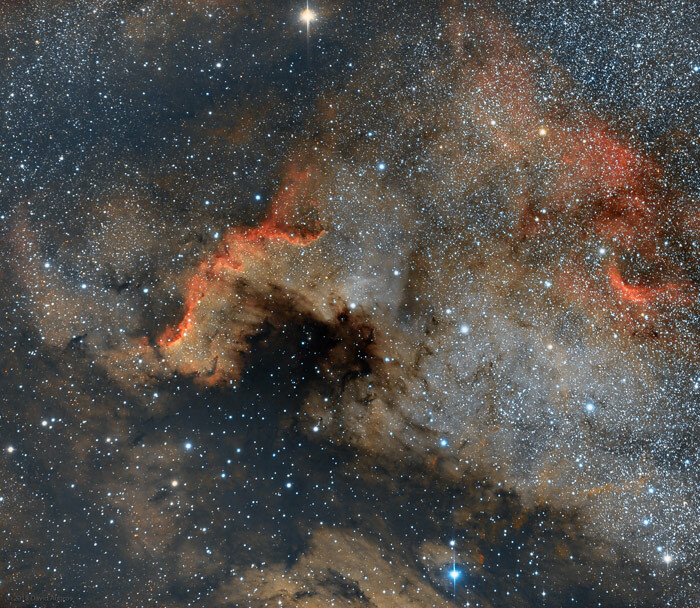 North America Nebula – NGC 7000 by AstroBin user David Augros. Copyright David Augros. Used by permission. NP101is APO refractor plus Large Field Corrector (LCL-1069) with Astronomik CCD CLS (light pollution block) Canon EOS Clip on modified Canon EOS 6D DSLR. This “light painting” is framed clockwise to put the “west coast” along a diagonal. From this perspective, “Central America” looks like the tip of an elephant trunk and the “US/Canada”landmass is the head. It is an elephant head unlike any other: with burnt-orange trunk and brow – with a fiery line extending below the eye. The back of the “head” is likewise adorned with this coloration. It floats beyond a dense sea of stars rich in blue. The Canon is astro-modified and is very sensitive to emission nebulae. When I first built this rig and pointed it at the Lagoon Nebula for a 300-second exposure at ISO 800, I was absolutely floored by what I saw on the LCD on the back of the camera. I had to double check that WiFi was turned off because it really looked as if I had downloaded an internet image. Anyway, I’ve been hooked ever since. 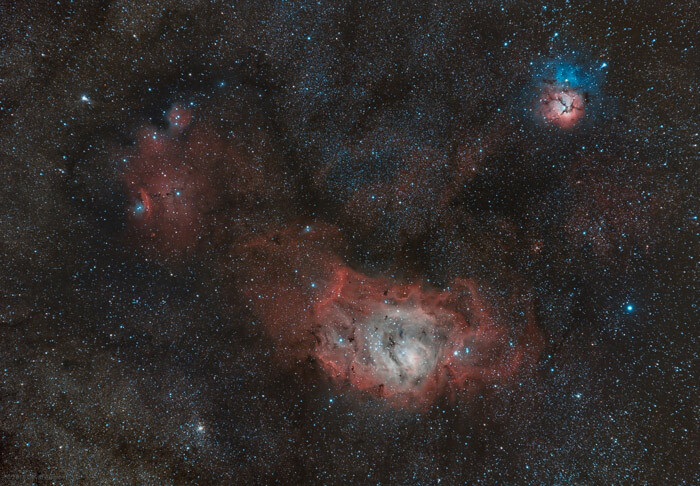 Lagoon & Trifid Nebulas by AstroBin user David Augros. Copyright David Augros. Used by permission. 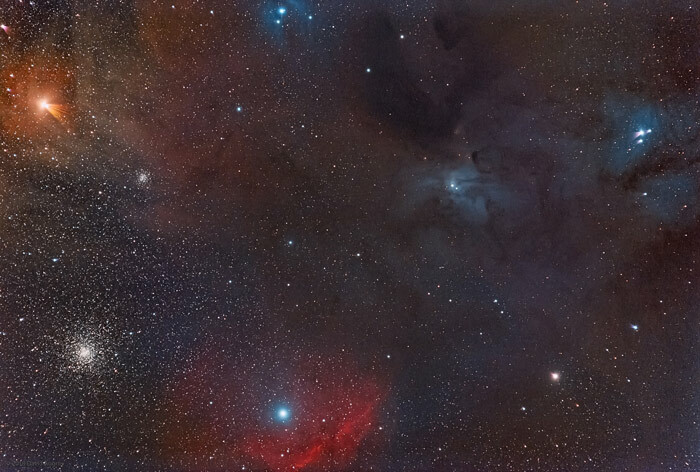 NP101is APO refractor plus Large Field Corrector (LCL-1069) with Astronomik CCD CLS (light pollution block) Canon EOS Clip on modified Canon EOS 6D DSLR. Undulating in a dark ocean, suspended with likewise colored dust and bright flecks, these nebulae take on the appearance of brilliantly lit red, white, and blue jellyfish. .
NPI-4057: Tele Vue-NP101is scope with included accessories. Al Nagler took Petzval’s portrait lens concept and patented a fast telescope version for the purpose of testing eyepieces (the 5”, f/4 Multi-Purpose Telescope). By 2001, the NP101 (Nagler-Petzval) scope was the ultimate culmination of 30-years of refinement toward optical perfection for the “multi-purpose” concept. 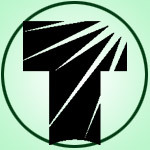 But we did not rest on our laurels: with the CCD imaging revolution challenging telescope optics beyond anything ever placed at the focal plane, we were determined to make the NP series optically, mechanically, and functionally as perfect as possible for imaging on chips with up to 50-mm diagonal without penalty to its near ideal visual operation. The resulting NP101is is a 101-mm objective diameter, 540-mm focal length, f/5.4, APO (4-elements in 2-groups, Nagler-Petzval) refractor with a whopping 5.3° image circle at prime focus. Maximum visual field-of-view is likewise huge: 4.9° with 55-mm Plössl (10x) or 41-mm Panoptic (13x). 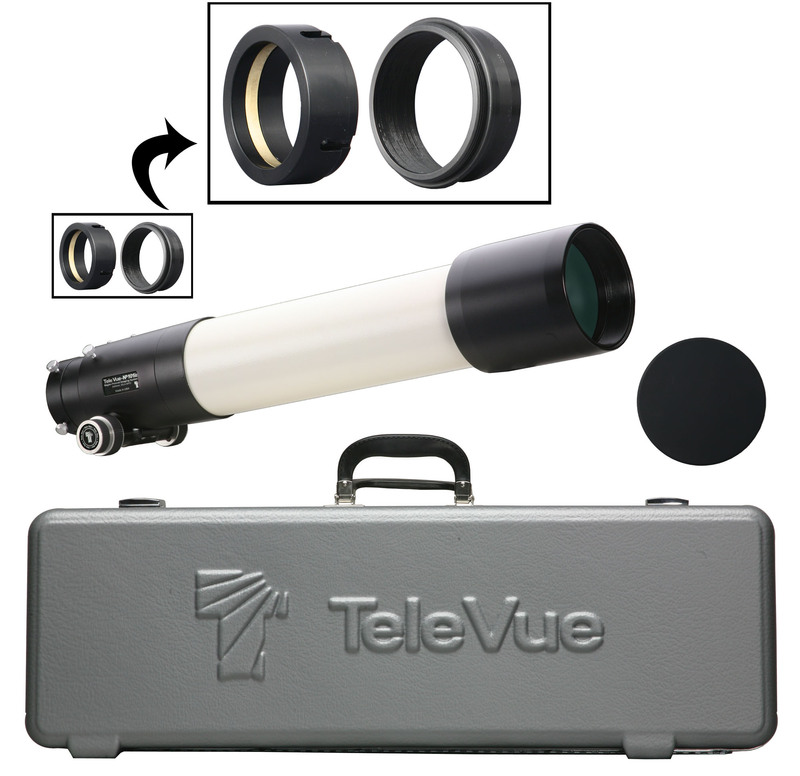 All Tele Vue telescopes come with a 5-year Limited Warranty. 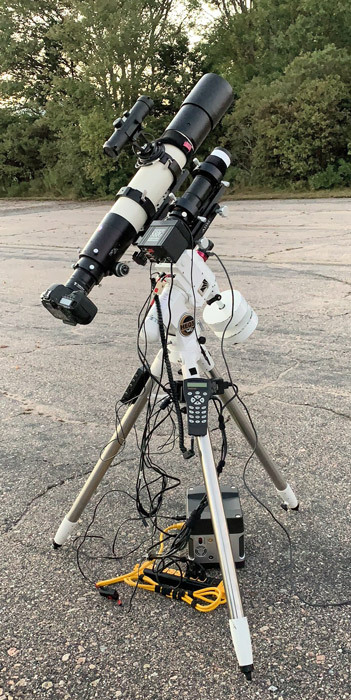 I do all my imaging from the Frosty Drew Observatory in Charlestown, Rhode Island. At less than an hour from light polluted Providence, where I live, it has some of the darkest skies in the state, especially to the south over the ocean. The director, Scott MacNeill, is a great supporter of local astrophotographers and runs outreach programs at the facility for Brown University. I really enjoy taking in the dark sky while listening to the waves crash on the nearby beach as my imaging rig whirs away and collects photons. Since I need to transport, build-up and tear-down my rig for every session, I really appreciate how lightweight this fast f/5 scope is. My HEQ5 has no trouble keeping it steady along with all the other gear I’m using. David’s portable setup consists of the Tele Vue-NP101is refractor with Tele Vue Large Field Corrector (LCL-1069) installed and modified Canon EOS 6D as the imager. A Mini Borg 50 with SBIG SG-4 is used for guiding. All this is carried on a SkyWatcher HEQ5 PRO mount. Processing is done using Adobe Lightroom and Pixinsight. David’s Tele Vue-NP101is imaging setup. Next Next post: Tele Vue: We’ll Always Have Paris!